Like many middle-aged AFOLs, the greys, blues and yellows of classic space Lego dominate my memory of childhood building. Now that I am getting back into the hobby, it is exciting to see the renaissance of neo-classic space. 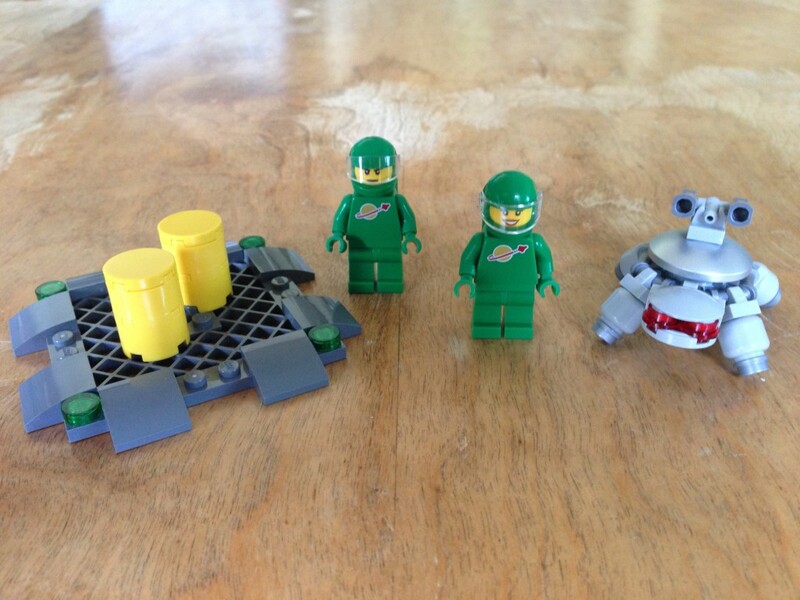 Many talented builders are still inspired by those happy little space men in their brightly colored space suits, and it was this nostalgia that helped fuel the successful Lego Ideas campaign for the Exo Suit. Being fairly new on the scene, I don’t know much about Peter Reid. 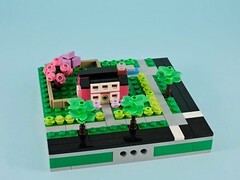 I do know that he is a very talented English builder with some impressive credits to his name. 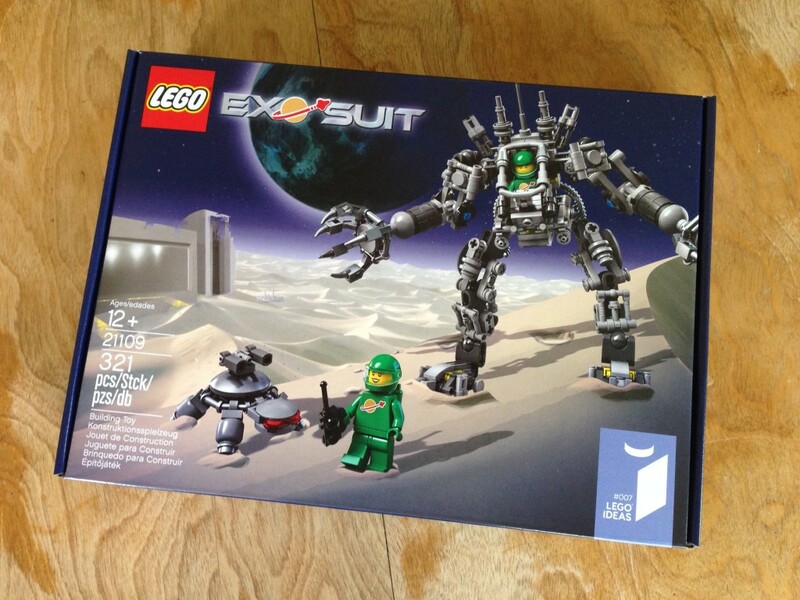 His Exo Suit was the first Lego Ideas (then Cuusoo) project, entirely based on new ideas, to get approved. 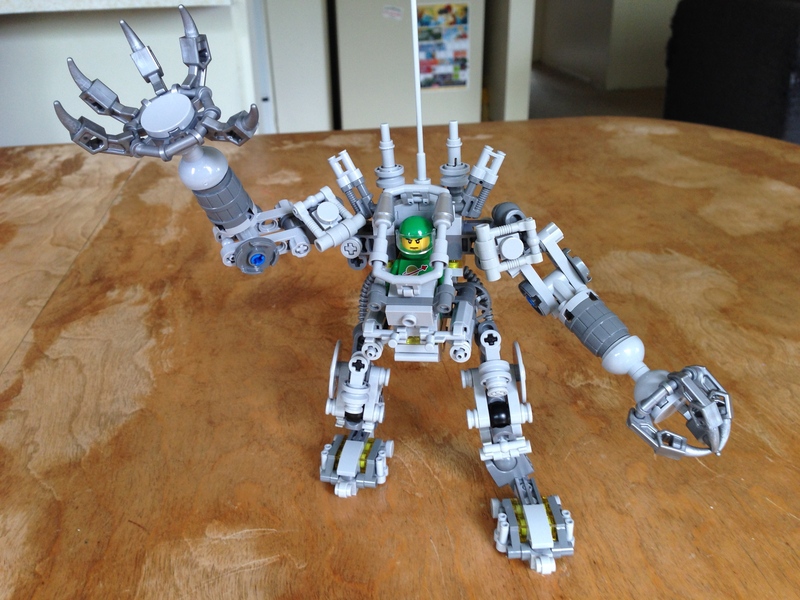 Lego put a lot of very public effort into making this set as true to the spirit of the original as possible, with Mark Stafford (who designs most of the mecha related sets) doing the design and a team of AFOLs helping to craft the marketing hype around it. The thoughtfulness really shows. The inclusion of a pair of neo-classic space people (a nod to Pete and his girlfriend) and the classic space logo incorporation really marks this set for nostalgic fans like me. I’ve been waiting on this set since it was announced and rushed impatiently to order it as soon as it was available. When the my backordered copies finally arrived last week, I got to building. The box is fairly standard for Ideas sets, sturdy and resealable. The perfect bound instruction book opens with colorful text about Pete and the set in a variety of languages. 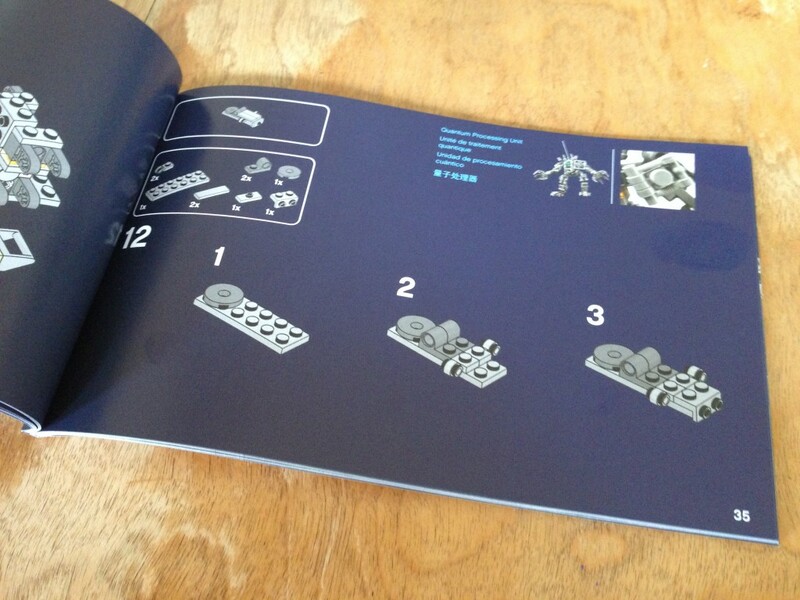 The instruction diagrams are fairly unadorned, just dark blue backgrounds. There are some interesting bits of images and flavor text scattered throughout, depicting features of the suit. I must say that I don’t like these small, perfect bound instruction books that much. They don’t stay open on their own and I wound up using my phone as a paperweight to hold it open as I built. Not a deal breaker in any way, but I prefer more practical booklets. The first builds are the auxiliaries: the space people, a platform with barrels, and a mechanical turtle bot (an adaptation of Peter Reid’s signature turtles). Even this part of the set has some elements, a number of pearl silver pieces and some translucent green tiles. The space people are decidedly neo-classic, with new style helmets and faces that are more detailed than the old smilies. Building the Exo Suit itself was a lot of fun. 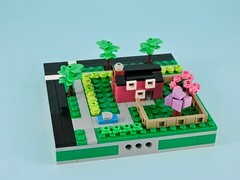 The build is intricate and fiddly. If memory serves, there is only one standard brick in the whole set and that was translucent yellow. This definitely isn’t a set from my childhood. The finished model is highly posable, though not as playable, as the greebles have a tendency to fall off. I’ve read since that the mold for the robot arm elements was on the end of its lifespan, explaining the very weak clutch. This is a wonderful set. It will be a rare builder that doesn’t enjoy putting this one together. I’d whole-heartedly recommend this set to anyone who is even remotely interested!